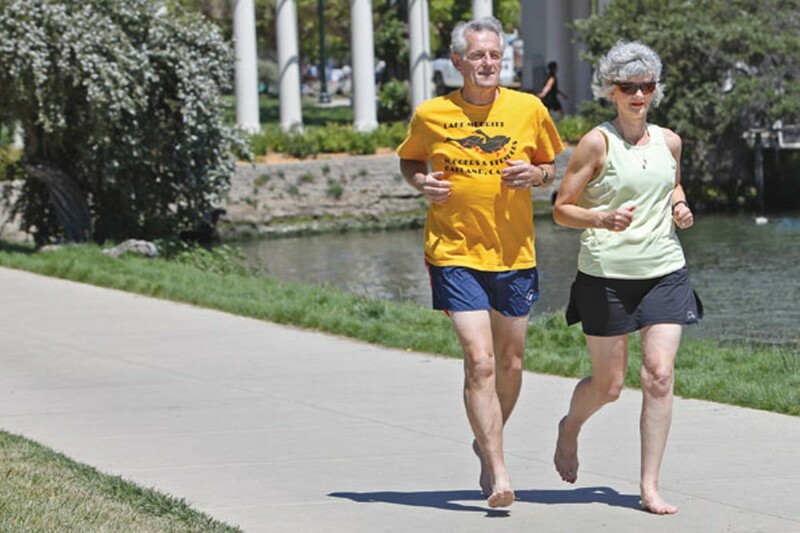 Joe Davis and Jan Hetherington have been running barefoot since she started using the Vibram FiveFingers and saw her ankle and Achilles problems fade away. Forget everything you know about running, starting with your shoes. The more you spent on them, the faster you need to trash them. Next is your stride: That long, heel-striking gait could be doing more harm than good. Finally, change your attitude: Running is a source of joy, not a fitness chore. These are the core tenets of a growing movement throughout North America known as barefoot running. The term "barefoot" has evolved in recent years as an umbrella for three distinct approaches — minimalist running shoes such as the Nike Free, ultralight footwear ranging from homemade sandals to the popular Vibram FiveFingers, and truly barefoot. Technically speaking they may appear to be at odds, but they share a philosophy: The less we rely on our running shoes, the better off we are. Proponents encourage a back-to-basics approach to running that should be both bliss-inducing and injury-free. Without a doubt, 2009 was barefoot running's year. Aside from Internet chatter and mainstream media coverage that introduced the concept to the masses, the biggest factor was a New York Times bestseller called Born to Run. It linked barefoot running with the success of Mexico's Tarahumara Indians, widely considered to be the world's best ultra-long-distance runners, and helped spawn a generation of barefoot and FiveFingers devotees. Meanwhile, the benefits of barefoot running and shortcomings of modern running shoes have been supported by a broad range of studies, most recently in the scientific journal Nature. By sheer numbers, barefoot running is still a fringe sport. There are no clear estimates of the total number of active minimalist and barefoot runners today, but the figure is certainly dwarfed by those who are merely aware of it, and again by those who have yet to catch wind of the trend. In a sport with tens of millions of participants worldwide, change is incremental. Yet a number of East Bay adherents see its promise as nothing short of revolutionary. At the reborn Oakland Marathon in March, a lone runner tackled all 26.2 miles, including several stretches of ragged asphalt, entirely barefoot. That man was 38-year-old Efrem Rensi of Oakland, running in his second marathon. He finished in 3:32, good for 77th place out of 946 finishers. Last July, he completed the comparably hilly San Francisco Marathon, also barefoot, in 3:36. His achievements in road racing illuminate one of barefoot running's most counterintuitive elements: Due to increased efficiency and feedback, it's often easier and more fun to run on hard, man-made surfaces than on cushioned natural surfaces. A proper stride without shoes provides better shock absorption than a faulty stride in fancy shoes. There was a time not too long ago when Rensi hated running — when the most he'd consider doing at a time was one or two miles. "That was my idea of running, just because it hurt," he said. "I would have Achilles problems and knee problems." The difference, of course: shoes. Repeat prognoses of over-pronation led to bigger, better, more costly styles, but the injuries persisted. He began conducting his own research on running mechanics, form, and injury, and soon discovered barefoot running. That's when everything changed. "Whatever reason people have for running, I now have more of it," Rensi said. "I get more out of it — that feeling like you're doing something with your body that's real." After discovering that technique and not gear was the secret to running, he never looked back. Rensi loves being barefoot so much, in fact, that he became what he calls a "full-lifestyle barefooter," joining the Society for Barefoot Living and wearing shoes only once or twice a month. He likes the camaraderie it brings. "Barefoot runners, we have our own little clique," he said. "A lot of us know each other, or know of each other." Soon, barefoot runners may outgrow their cliques. While most big-city marathons these days include one or two true barefoot runners, the 2010 LA Marathon, held a week before Oakland's, featured a record eleven. Rensi predicts that minimalist running shoes such as the Nike Free — which was introduced five years ago and has seen such a surge in interest over the last year that it's on backorder in most local running shops — will become the new industry standard. Nike now includes references to the "brilliance of barefoot running" in its promotional materials, and other shoe companies including Adidas and New Balance may be following suit with their own minimalist styles later this year. Yet the Vibram FiveFingers is the reigning king of shod "barefoot-style" running. A flexible shoe/sandal hybrid with a thin, lightweight rubber sole and an elastic fabric upper — plus its trademark articulated toes — the FiveFingers has become the darling of the new wave of minimalist runners who nonetheless want a layer of protection between their feet and the ground. The shoes have been flying off the shelves of the few East Bay running stores that carry them, such as Pleasant Hill's Fleet Feet and Oakland and Berkeley's TransSports, which has sold as many as fifteen pairs a day at $79.95 a pop. Both stores report that Vibram can't keep up with demand and is months behind on orders. Marie Lanka of San Jose, who often runs in the East Bay, is a satisfied customer. She bought a pair of Vibrams about a year ago after reading Born to Run, and found that they eliminated the stubborn running injuries she used to suffer through. "I was a big-time heel striker, and I had no idea I was doing it until I got rid of all these special gizmos," she said. "I was really hitting the ground hard." Once she tried the Vibrams, she said, her stride shortened, her posture straightened, and her strike shifted to mid-foot. The pain in her hips and back vanished. "My IT bands used to scream at me so loud I couldn't sit down, but now I feel like a kid again," she said. Just last week she did sixty miles, including a thirteen-mile trail race in which she won her age division. Still, some people are wary to accept barefoot running as the miracle cure it's touted to be. Chiropractor Jessica Greaux, who treats elite runners at her Berkeley office, including 2008 Olympian Magdalena Lewy Boulet, believes the benefits of running barefoot or in Vibrams are often exaggerated. "It's not going to work for everyone," she said. "Some people will benefit, other people will not. Some people will get injured." Greaux, who has been performing video analysis for runners since 2001, said that simply going shoeless won't repair some issues, particularly those that relate to hip rotation. Even so, many of her patients are now self-prescribing FiveFingers shoes, a habit that Greaux considers dangerous. "It's a new toy," she said. "What we get nervous about when we hear about these fads or trends is people going out too fast, too soon." Even Rensi the barefooter agrees, tempering his success story with disclaimers: First, barefoot running and minimalist shoes are only helpful if you can already run correctly; and second, problems caused by bad running habits will only worsen in minimal shoes or barefoot. He and other "true barefoot" adherents also suggest that the minimalist shoe craze has been drummed up by shoe manufacturers in order to profit off interest in barefoot running, without providing any data to suggest the two are equivalent. Nevertheless, both approaches are gaining steam and sure to attract curious runners in the coming warmer months. San Francisco's Shawn Davenport is counting on it. Last December he formed the San Francisco Barefoot Running Club to help share practical knowledge with newcomers, and after a somewhat lax start is looking forward to a busy summer. Although he has yet to organize an official event or perform any outreach, the club's Facebook page already claims 64 members. Back in the East Bay, Oakland couple Jan Hetherington and Joe Davis are apt to keep going their own way. Hetherington, 59, started with a pair of FiveFingers last October, and says she saw her ankle and Achilles problems fade away. When she transitioned to true barefoot, she found running even more pleasurable. Davis, 67, a longtime runner who has completed eighteen marathons since 1996, followed her lead and discovered that going barefoot actually increased his speed while reducing the impact on his back. He still does most of his running in shoes, but Hetherington is a convert: "I had never experienced what it feels like to have that joy," she said. "You're just moving in a more efficient way." She's already begun training for her first barefoot marathon: Oakland 2011.